We should have been on our way back now from Shilpa Kala Vedika, Hi-Tech city, but we are safely sitting at home and am writing this blog :). I had booked for Niladri Kumar’s Sitar concert a week back and even put it on our calendar so we don’t forget. The only thing I forgot was to put a reminder for the morning. The concert was part of the Aadi Anant series. “Aadi” means beginning, and “Anant” means infinite. We completely forgot about the booking and for some strange reason I thought it was on Feb 6th. Today happens to be Dr. Vijaya Venkat’s birthday and I was remembering her since morning and I picked up the phone around 4.30 to see if I was missing anybody else’s birthday today and thats when I saw the concert was today. We stay about 30 kms from Hitech City in Hyderabad and the concert was at 6.30. We quickly got dressed and left by 5.20 pm. We managed to go for about 4 kms before getting caught in a traffic jam. The jam was caused by the various political parties campaigning for the upcoming GHMC (Municipal corporation). Vehicles filled with supporters were blocking traffic at every traffic signal and it took us 45 minutes to just cover 8 kms of the 30 kms. We decided to turn back and got back home by 6.30, exactly when the concert was to start. The fact is we forgot about the concert and had less time to reach the venue, but even if we had remembered, we would have to assume about 2 hours to cover a distance of 30 kms. A colossal waste of time spent in traffic – fuel is wasted, time is wasted, air is polluted, health is spoilt and in some cases, people’s blood pressure shoots up. Almost every major city is reeling under this traffic menace. Am sure there are experts on traffic management who can decongest and make corrections to the flow of traffic that reduces this pain. 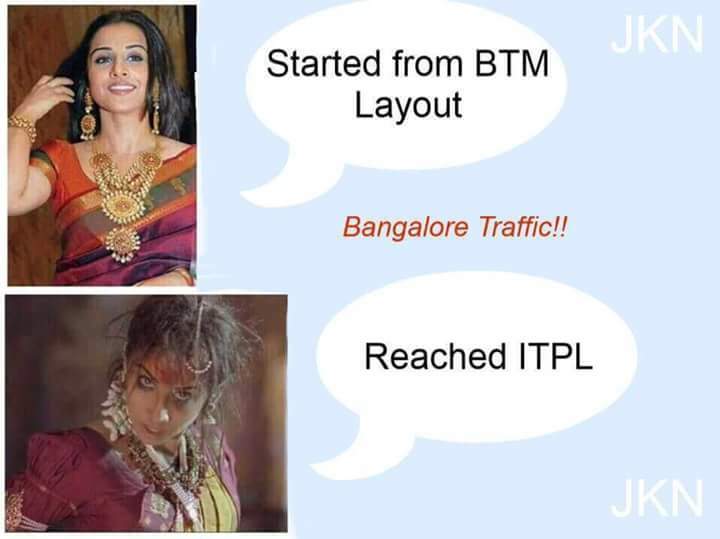 This picture was forwarded on WhatsApp today and it talks of the Bangalore traffic situation, but it can be applied to any of the major cities in India today. Today we didn’t get to Aadi-Anant because of Gaadis-Anant (Vehicles-infinite). Thankfully I didn’t turn into Vidya Balan’s avatar in the picture above :):), just went with the flow and stayed cool. We need to do something different than the west which depends on cars as the norm for transporting . MRT is the answer , but the governments are busy doling out freebies which gets stolen by middle men . No funds are left for infrastructure development . At the rate at which number of cars are increasing soon whole of India will be one gridlock . Its time we started looking for alternatives beyond these two corrupt parties . It’s the same wine in different bottles . Fed up ….